As the availability of digital information continues to increase, there is a need for flexible tools that help faculty and students integrate electronic content into their teaching and learning. The Visual Understanding Environment (VUE) is an information management application that provides an interactive, concept mapping interface to digital resources accessed via the Web, from FEDORA-based digital repositories, FTP servers or local file systems. 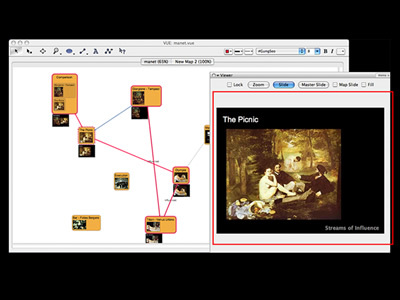 Using a simple set of tools and a basic visual grammar consisting of nodes and links, faculty and students may map relationships between digital content to capture and communicate concepts and ideas. 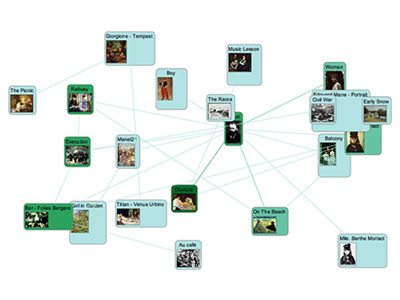 The resulting content maps can then be shared with others. VUE leverages the cognitive benefits of concept mapping as an interface and information visualization techniques to support the creation of rich resource-based, instructional or research-oriented presentations. VUE can be used by anyone interested in visually structuring digital content, whether in support of teaching difficult to understand concepts or more generally, a tool for organizing personal digital resources. While VUE can be seen as a general information management utility with broad applications, the latest version of VUE was designed with education in mind. VUE provides a concept mapping interface to digital libraries which allows faculty and student to link and map relationships between educational materials. VUE also supports author-defined pathways through maps of digital content, the ability to filter map content based on user-defined metadata, and the comparison of two maps side-by-side.